It’s always been a mystery and a challenge, attempting to climb on the top of Google’s organic search results, this by twisting and tweaking a sites content and structure. As a result of this great unknown, search engine optimization (SEO) has spawned into a multimillion dollar industry. SEO as a business has exploded in popularity because companies as well as online marketers of varying sizes and backgrounds can make or break their online efforts depending on where their website happens to rank on Google. There are also those who try to “game” the system by offering “pie in the sky” schemes for sale, or attempting to trick the likes of Google by finding loopholes in their algorithm, which temporarily slings their usually poor content sites on the top of the search results. Once Facebook decided to open their doors to commerce, it then became a destination for businesses and marketers, of all sizes, to establish their product or brand on Facebook. This created a brand new online marketing segment altogether. Most of these “big brand” companies have managed to attract thousands to millions of “Fans” to their Facebook Pages, but this is where the mystery which is Facebook begins. What Facebook is currently doing is filtering out updates or posts made by these Facebook Page owners, seemingly at random, so just a few select “Fans” who liked their page will receive the postings on their NewsFeed page. This occurs because of Facebook’s own unique algorithm that they’ve developed. These companies who has managed to attract millions of fans to their Facebook pages, their fans are not always getting their updates. So as a result, what’s born is yet another new segment in online optimization, which is still in its infancy, that focuses on optimizing the Facebook users News Feeds. This is still on the bubble stage, however, since it’s still a big unknown how Facebook’s algorithm ticks. If you hop on a time machine and go back a decade to 2001, this almost identical problem faced the majority of marketers and companies when attempting to get top ranking on Google’s organic search pages. So what’s sprouting are a handful of these social media marketing optimization companies, which are getting significant venture “seed capital,” in the hundreds of millions of dollars, to solve the mystery that is Facebook NewsFeed Optimization. EdgeRank is what Facebook refers to as how they sort out and filter the News Feed results, and how these results are decided and allocated. This EdgeRank algorithm keeps all of the users on Facebook updated on what their friends are doing, without trying to overwhelm them. Although it’s still not clear when EdgeRank went into effect, most experts will pinpoint a defining moment back in 2010, when Facebook originally began providing public information on how they exactly curate the users’ news feeds. The details are still minimal and select, but what’s revealed is that EdgeRank is based on how close or familiar two friends on Facebook are, which also includes the relationship between an individual and a fan page. This selection is based on how valuable the activity is, as well as how often the exchanges are between these friends, such as sharing photos, videos, or messages between each other, which is more important in “Rank” than someone who just clicks on a “Like,” and then forgetting about it. So the key may be interaction. There are a handful of these EdgeRank factors and measurements which are taken into account, but are not revealed, and similar to Google, it’s a ongoing moving target, as Facebook is constantly tweaking their algorithm. 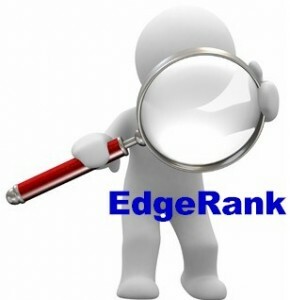 The EdgeRank algorithm is becoming extremely important to businesses, especially those who need to justify the huge budgets that they’ve spent on Facebook marketing and optimization their Fan Pages, and yet getting poor results. It’s estimated, by various Facebook analytics, that businesses who happens to make a post or an update on their Facebook Page will reach, on average, just 9% percent of their fans. What clouds the issue is those Facebook friends of yours who continuously feel that they need to make 20 posts of funny images, their pets, or what they ate for lunch on a daily basis, which clogs up the NewsFeeds further, and the percentage drops. There are others who claim that updates on Facebook Pages will reach anywhere from 20% to as high as 36% percent of their fans. So for every 1000 fans that a Facebook Page has, the message that they just posted appears on approximately 90 (9%) to 360 (36%) of their hard earned fans news feeds. So the future for the social media marketing scientists is cracking the code which is the EdgeRank algorithm, and how it affects Facebook pages based on it’s relationships and its engagement with their fans. What’s being analyzed are the inputs, which includes the posts from Fan pages, to the outputs, which is Facebook’s particular metrics on who actually sees these posts. So the biggest puzzle is solving what happens inside the little black box. Despite applying all of the various formulas, the majority agree that what matters the most is posting content that people are interested in, and what the best ways to reach them are. The entire search industry as a whole has created their own band of “snake-oil” salesman, who are offering their own potions and magic lotions in an attempt to exploit the system. When it comes to Facebook, the most common “game” is attempting to boost a particular Fanpage’s rank with fake fans. So for those who proclaim, “We’ve solved the Facebook Edgerank code,” most are likely completely false, poorly researched, and the vendors are out just to make a quick buck. So what does Facebook get out of EdgeRank, there must be some internal intent. The most likely end game for Facebook is they creating additional revenue streams by generating income from these businesses who own Fan Pages, eventually convincing them to pay for their posts and how many fans they want to reach. The theory is, for their posts to rise to the top of their fans News Feeds, or to reach as many of their fans as possible, there may ultimately be a fee attached to the owners of these Fan Pages to do so. One recent indication on how Facebook intends to increase their advertising revenue is the introduction of a program called “Reach Generator.” What Reach Generator does is it allows businesses and their brands to “pay” to reach more of their fans. There are also rumors that there’s a “pay to promote” program in the works which is directed towards individual users. So this may ultimately be what Facebook EdgeRank is all about.